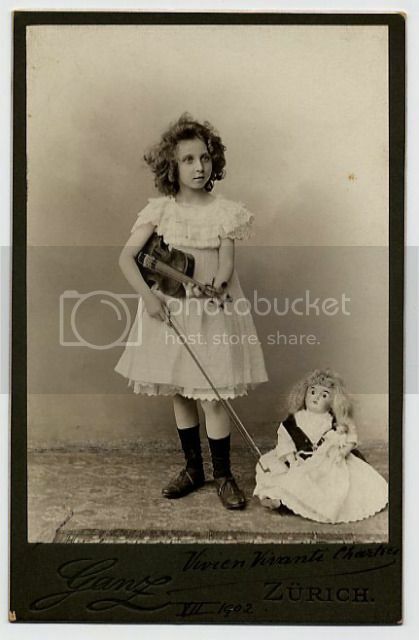 Here's part 2 of 4 of a long essay on turn-of-the-century violin prodigy Vivien Chartres and her famous author mother Annie Vivanti. Part 1 is here. I was horroruck. I led her into the breakfast-room with a trembling heart, and showed her her presents arrayed on the table. Fortunately she was pleased with them, and was especially delighted with a false beard that her father had put on for the occasion. I had to wear it all through breakfast because it amused her; and she insisted that Mary should wait at table in it that evening, when we had guests for the birthday dinner. I was so shaken by what she had said in the morning that I could refuse her nothing. Mary wore the beard; but was very cross about it, and gave me notice next day. Thanks to the instruction of her teacher, her mother’s encouragement, and her own remarkable innate talent, Vivien soon began to excel in a truly shocking way. A few months after she began playing, she was performing Svendsen’s Romance. Around that time Vivien visited her great-uncle, Paul Lindau, in Paris. He was astonished by her progress and suggested that mother and daughter travel to Prague so that Vivien could audition for arguably the greatest violin teacher in Europe, Otakar Ševcík. Being accepted into the Ševcík studio would be no small feat; it would be, in a way, an achievement akin to Annie Vivanti befriending Carducci so many years before. Ševcík’s services were in remarkably high demand; over the course of his career, he rejected hundreds of pupils, many older than Vivien. According to Vivanti, after hearing her uncle’s suggestion, she took Vivien straight to Prague from Paris, without even telling her husband of her plans. After a dirty, disagreeable trip by train, Vivien decided to wash her violin and bow before her audition so that they might feel fresh and clean before the momentous day. 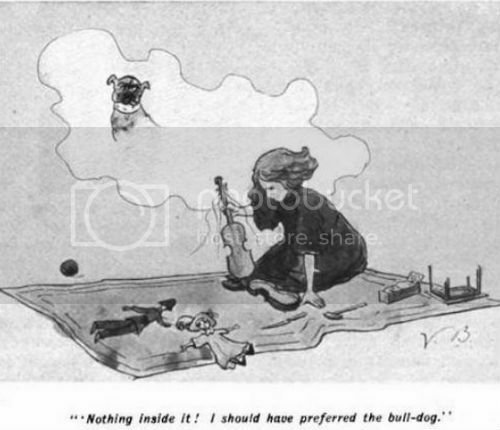 Of course after this treatment the violin could no longer speak. But somehow mother and daughter secured a second instrument on which Vivien auditioned. Otakar Ševcík was a giant of nineteenth century pedagogy. Born in 1852, this shy, thoughtful, generous man was one of the great instructors of the late Victorian era. His students included some of the greatest violinists of the age: Marie Hall, Jan Kubelík, Erika Morini, and Efram Zimbalist, among others. He had a punishing professional regime: he usually began to teach at seven in the morning, took a break in the afternoon, and then worked late into the night. He expected his select students to be just as committed to their education as he was, and he advised them to practice no less than eight hours a day.